Beit T'shuvah is a Los Angeles based synagogue community with a mission to guide individuals and families towards a path of living well, so that wrestling souls can recover from addiction and learn how to properly heal. 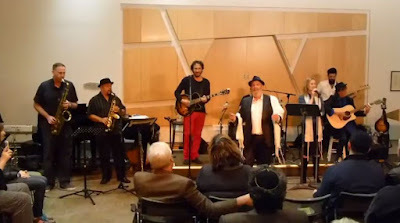 They also have a band, and in 2015 they recorded a Beatles Shabbat service with all the familiar songs in the Friday night liturgy sung to some of the most popular Beatles songs. We previously posted their version of Lecha Dodi set to Let it Be. Here's another excerpt from the service with the shul band welcoming Shabbat with V'Shamru set to Hey Jude. Officially ordained in 2000 at the University of Judaism with a Master's in Rabbinic Literature, Rabbi Borovitz combined his knowledge of Torah and street smarts to shape his calling: helping recovering addicts find their way in the world. After being released from prison in 1988 he began his work at Beit T'Shuvah. Over the past twenty-eight years, he has co-created one of the most exceptional approaches to addiction treatment and criminal rehabilitation and reintegration in the world. Love this version of Ve'shamru. Please more like this one.